For many years the mechanism whereby hGH transduces signal via its receptor through the membrane remained a mystery. One of the most crucial and yet surprising findings in this respect was the discovery that one hGH molecule can bind two molecules of the hGHR. Both functional (13) and crystallographic (1,14) data were used to demonstrate the stoichiometry of binding. Fig. 3. Sequential dimerization mechanism for the binding of hGH to its cell surface receptor (taken from ref. 15 with permission). hGH has two receptor-binding sites labeled as Site 1 and Site 2. At low concentrations (<1 nM), hGH first binds to a receptor through its high-affinity site (Site 1). Then, through a two-dimensional diffusion process, this 1:1 complex binds to a second free receptor. This 1:2 complex triggers signal transduction. At very high concentrations of hGH, receptors can be saturated in 1:1 complexes and self-antagonism occurs. ometry of binding was further supported by analysis of components found in crystals of hGH and the extracellular domain of hGHR (14). The two receptor-binding sites on hGH are referred to as Site 1 and Site 2. Through the use of mutagenesis data it was demonstrated that receptor binding occurs sequentially (Fig. 3) (13,15); hGH first associates with an hGHR to form a 1:1 complex through Site 1, the high affinity site. This complex is then capable of binding a second receptor through Site 2 of hGH. Significant hGHR-hGHR contacts also contribute to the stability of the ternary complex. No evidence exists for the formation of a 1:1 complex through Site 2. Fig. 4. The crystal structure of the 1:2 complex of hGH with its receptor (modified from ref. 1). The two receptor binding sites on hGH are shown as shaded areas and are labeled as Site 1 and Site 2. Approximately 1300 A2 of hGH is buried at the Site 1 receptor interface, whereas only 900 A2 of hGH is buried between the hormone and receptor at Site 2. Additionally, the contact surface between the C-terminal domains of each receptor is shown. This receptor-receptor interface constitutes about 500 A2 of buried surface area at Site 2. This mechanism of action is further supported by the crystal structure of the 1:2 complex of hGH and the extracellular domain of its receptor (Fig. 4) (1). Site 1 on hGH has a much larger receptor-binding site than Site 2. Approximately 1300A2 of hGH surface area is buried at the Site 1 interface whereas the interface between the hormone and receptor at Site 2 consists of only about 900A2. Furthermore, the crystal structure shows that about 500A2 of area is buried at the interface between the C-terminal domains of the receptors. The relative sizes of these interfaces helps to rationalize the sequential dimerization mechanism. Because the entire Site 2 interface consists of both hGH-hGHR and hGHR-hGHR contacts, binding at Site 1 is likely a prerequisite for formation of the 1:2 complex. In addition, the affinity between the two soluble extracellular domains in the absence of hGH is too weak to be measured (13,16). Little evidence exists for a large conformational change in either hGH or the hGHR on association at Site 1. The structure of an unbound mutant hGH shows essentially the same global structure as the receptor-bound wild-type hormone (8). Some minor structural changes have been seen in one of the minihelices in a recent structure of the free hormone (17). The structure of the free receptor has not been solved yet; however, little structural change is seen in the bound receptors. The structure of the 1:1 complex overlaps very well with that of the 1:2 complex (17a). Additionally, the two receptors in the 1:2 complex superimpose with each other, including the relative orientation of the N-termi-nal and C-terminal domains. The hGH-binding site on the receptor consists of residues from both the N-terminal and C-terminal domains around the hinge region. The first 30 amino acids of the N-terminal domain are not visible in the 1:2 structure and are not important for hGH-binding (17a). The residues on the receptor that make contact with hGH are predominantly found in the loops that are near the two-domain linker segment. Interestingly, nearly the identical set of residues on each receptor are used to bind two very distinct sets of residues on hGH (Site 1 and Site 2). This demonstrates the remarkable recognition flexibility designed into the hormone-binding site of the receptor. Generally, the residues on hGH that are important for Site 1 binding reside on the two minihelices between helix 1 and helix 2, and along the solvent exposed face of helix 4. This binding site on hGH is slightly concave (1). 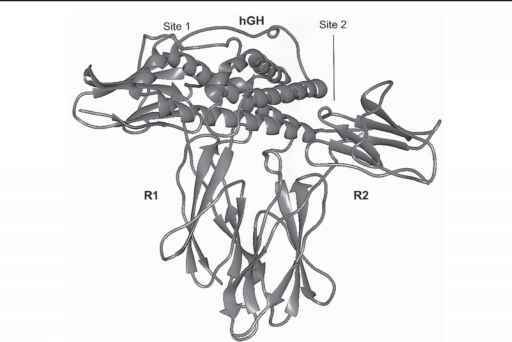 Side-chains on Site 2 of hGH that are important for interaction with the hGHR reside on the N-terminal region on one side of helix 1, and along the exposed face of helix 3. Compared to Site 1 on hGH, the second receptor-binding site is relatively flat. Interestingly, the hGH residues that are functionally important in Site 1 are completely different in nature than those involved at Site 2 (13). 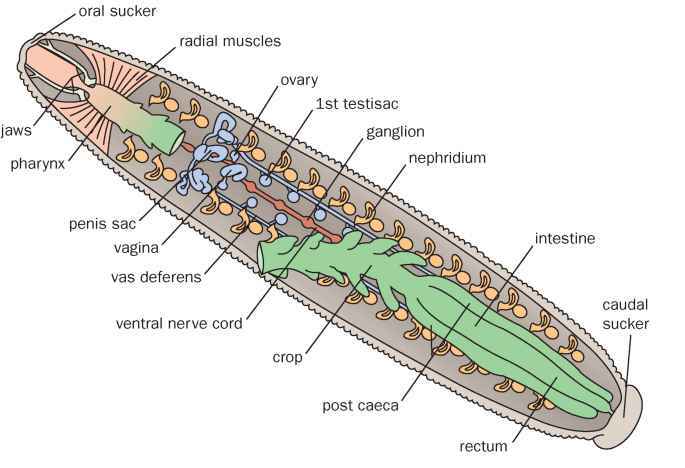 Many experimental studies support the notion that the 1:2 complex is the transmembrane signaling species. First, some anti-hGHR monoclonal antibodies (MAbs) are capable of acting as agonists for signal transduction in a cell-based assay (18). Second, chimeric receptors consisting of the extracellular region of the hGHR and the transmembrane/intracellular domains of the granulocyte colony-stimulating factor receptor (G-CSFR) are fully capable of transmitting a G-CSF-like signal in response to hGH (15,19). These studies support the model that receptor dimerization at the extracellular domain simply serves the purpose of bringing intracellular domains within close proximity. Furthermore, one particular site-directed mutant (G120R) that destroys Site 2 binding, but does not interfere with Site 1 binding, does not confer growth-promoting activity (15,20,21). This Site 2 mutant can also act as an hGH antagonist by locking up receptors in 1:1 complexes (15,22). Similarly, when very high concentrations of hGH are used in a cell-based assay, self-antagonism is observed (18,23). 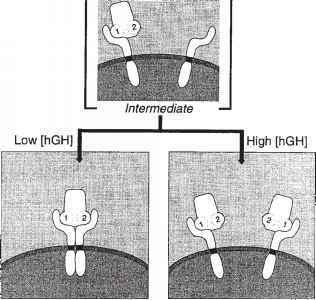 This demonstrates that when hGH receptors are fully occupied in 1:1 complexes at Site 1, no signal can be transmitted.